The transition from GCSE courses to sixth form studies represents a major hurdle, but it is a challenge which our students have accepted confidently in the past. Good results at GCSE have been converted into impressively strong AS and A-level grades in recent years. The considerable ability of our students partnered with the high quality of advice and guidance they receive both contribute to their success in the sixth form and beyond. I am confident that the sixth form experience we provide offers an excellent platform for students to progress to higher education and in their future careers. At the same time students have the opportunity to enjoy a wide range of activities as well as being encouraged to take on leadership roles. 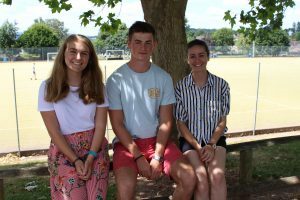 The high achievement of our A-level and BTEC students is a major source of pride to us and them as they leave to take up places in some of the country’s leading universities. I am sure that our future students will have the same equally high aspirations as our current students and will be looking forward to the opportunities and challenges which lie ahead. Our Sixth Form is very successful; this is because we expect everyone, students and staff alike to aim for the best in all that they do. We also recognise that both staff and students develop enjoyment and a sense of achievement when there is full commitment all round. As sixth formers students have more freedom and privileges, but in turn this brings more responsibility for their studies and conduct. As the most senior members of the student community, students are expected to provide a good example to the rest of the school. Personal responsibilities will naturally include a proper regard for acceptable conduct and we expect all students to display consideration in all matters, in order that a happy and positive atmosphere can be maintained within the sixth form and the school as a whole. The Sixth Form provides the environment in which students can develop the self discipline and organisational skills required for higher education and the world of work. Students have fewer contact hours with teachers than in lower school and while a small amount of this non-contact time can be spent relaxing in our excellent common room, the vast majority will need to be used effectively in study to support learning in the classroom. Y12 Student in Chemistry Olympiad Success!